Despite the abundance of research reporting authentic, student-centered classroom discussion helps to increase engagement with literary texts and deepen students’ understanding of texts, little authentic, student-centered discussion actually occurs in secondary US English classrooms. Reasons for this vary, but some classroom language researchers suggest teachers find it difficult to implement non-recitation frames for discussion, even when they desire to do so. Replacing a traditional classroom discourse pattern with a less familiar model is a complex task. Teachers may need opportunities to practice less familiar social and communicative behaviors. The Web Pen Pals project described in this paper provided an opportunity for beginning English teachers to practice authentic discussion about literature in a synchronous CMC environment with adolescents. The researcher employed case study analysis of three beginning teachers to answer the following question: How do preservice English teachers discuss literature online with middle school students? Of particular interest was topic management; researchers suggest characteristics of the synchronous chat medium support topic negotiation rather than control by any one user. Findings revealed that beginning teachers may bring traditional discourse expectations about teacher-student roles in discussion to CMC tasks, which may work against the development of authentic discussion in a CMC environment. Groenke, S. (2010). Missed Opportunities, Misunderstandings, and Misgivings: A Case Study Analysis of Three Beginning English Teachers’ Attempts at Authentic Discussion With Adolescents in a Synchronous CMC Environment. Journal of Technology and Teacher Education, 18 (3), 387-414. Waynesville, NC USA: Society for Information Technology & Teacher Education. Retrieved April 22, 2019 from https://www.learntechlib.org/primary/p/27085/. Anagnostopoulus, D., Smith, E.R., & Nystrand, M. (2008). Creating dialogic spaces to support teachers’ discussion practices: an introduction. English Education, 41(1), 4-12. Anagnostopoulus, D., Basmadjian, K.G., & McCrory, R.S. (2005). The decentered teacher and the construction of social space in the virtual classroom. Teachers College Record, 107(8), 1699-1729. Alvermann, D. E. (1996). Peer-led discussions: Whose interests are served? Journal of Adolescent and Adult Literacy, 39, 282-289. Avi. (1991). Nothing but the truth: A documentary novel. New York: HarperTrophy. Berge, Z. (1997). Characteristics of online teaching in post-secondary, formal education. Educational Technology, 37(3), 35-47. Bonk, C.J., Hansen, E.J., Garbner-Hagen, M.M., Lazar, S., & Mirabelli, C. (1998). A time to “connect”: Synchronous and asynchronous case-based dialogue among preservice teachers. In C.J. Bonk & K.S. King (eds. ), Electronic collaborators: Learner-centered technologies for literacy, apprenticeship, and discourse (pp. 3-24.) Mahwah, nJ: Lawrence erlbaum. Burbules, N.C. (1993). Dialogue in teaching: Theory and practice. New York: Teachers College Press. Cazden, C. (1998/2001). Classroom discourse: The language of teaching and learning (2nd ed.). Portsmouth, nH: Heinemann. Crystal, D. (2001). Language and the internet. New York: Cambridge university Press. Davidson-Shivers, G.V., Muilenberg, L.Y., & Tanner, E.J. (2001). How do students participate in synchronous and asynchronous online discussions? Journal of Educational Computing Research, 25, 351-366. Dodson, M. (2000). Monologic and dialogic conversations: How preservice teachers socially construct knowledge through oral and computer-mediated discourse. National Reading Conference Yearbook, 49, 137-152. Eeds, M., & Wells, D. (1989). Grand conversations: an exploration of meaning construction in literature study groups. Research in the Teaching of English, 23(1), 4-29. Gilles, C., & Pierce, K. (2003). Making room for talk: examining the historical implications of talk in learning. English Education, 36, 56-77. Hatch, A. (2002). Doing qualitative research in education settings. New York: SunY Press. Herring, S. (2004). Computer-mediated discourse analysis: an approach to researching online behavior. In S.A. Barab, R. Kling, & J.H. Gray (eds. ), Designing virtual communities in the service of learning. New York: Cambridge university Press. Jeong, A. (1996). The structure of group discussions in online chats. Journal of Visual Literacy, 16(1), 51-63. Jewell, T.A., & Pratt, D. (1999). Literature discussions in the primary grades: Children’s thoughtful discourse about books and what teachers can do to make it happen. The Reading Teacher, 52, 842-850. Levin, B.B., He, Y., & Robbins, H.H. (2006). Comparative analysis of preservice teachers’ reflective thinking in synchronous versus asynchronous online case discussions. 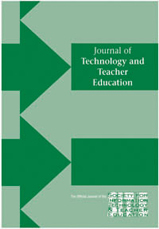 Journal of Technology and Teacher Education, 14(3), 439-460. Myers, W.D. (2001). Monster. New York: amistad. Stacey, E. (1999). Collaborative learning in an online environment. Journal of Distance Education, 14(2), 14-33.